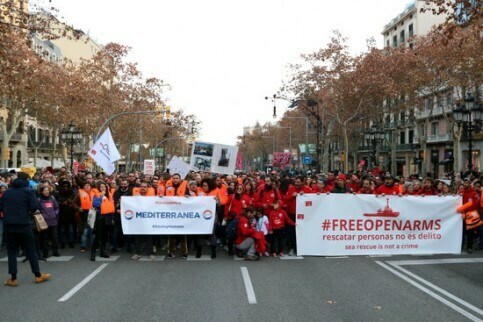 Hundreds of people rallied against Spain’s prohibition on NGO Open Arms to sail for the Mediterranean in order to begin a new search and rescue mission in Libyan waters. 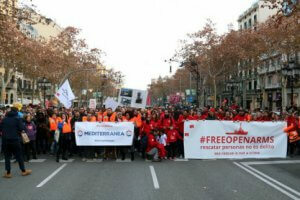 The march, on Saturday evening, was called by the volunteers of the NGO in Barcelona, where a rescue boat of Open Arms continues to be blocked in the port. The Spanish government has so far only allowed it to sail in Spanish waters, thus preventing it to save migrants in international waters. For this reason the head of Open Arms, Oscar Camps, blamed Madrid for the death of 117 people in the Mediterranean on Friday due to another sinking. ‘No person is illegal’ and’not rescuing is killing’ were some of the chants heard during the march. ‘The days that the boat has been blocked are counted by deaths and not hours,’ was also heard at the end of the protest.